The following pattern will be used: "Operation" indicates user operation using the smart key system. "Expected operation of the vehicle" indicates how a known good vehicle will react in accordance with each operation. "Suspected Area/Diagnosis" indicates suspected malfunctioning areas and tips for each diagnosis if the vehicle did not react as expected. (a) DTC numbers and ECU Data Lists of the smart key system can be checked using the Techstream. (b) Check for DTCs using the following procedure. If any DTCs are output, diagnose those DTCs first. (2) Turn the engine switch on (IG). (3) Enter the following menus: Body Electrical / Smart Key, Power Source Control or Starting Control / Trouble Codes. (c) If the engine switch cannot be turned on (IG), follow the procedure below to start communication between the Techstream and vehicle. (1) When using the Techstream with the engine switch off, connect the Techstream to the DLC3 and turn a courtesy light switch on and off at intervals of 1.5 seconds or less until communication between the Techstream and the vehicle begins. Then select the vehicle type under manual mode and enter the following menus: Body Electrical / Smart Key. While using the Techstream, periodically turn a courtesy light switch on and off at intervals of 1.5 seconds or less to maintain communication between the Techstream and the vehicle. (d) If cancel is selected for the smart key system customize setting, cancel the smart key cancel setting (See page ). (a) The electrical key transmitter sub-assembly and electrical key and TPMS receiver assembly can operate on two different RF channels. When an electrical key transmitter sub-assembly is brought within an exterior detection area, key verification begins. If key verification fails due to wave interference, the channel will be switched and key verification will be performed again. The multi channel system begins verification using the channel on which the last verification was successfully performed. When verification fails, the system switches to the other channel. Exterior detection areas are created using LF waves (emitted from the vehicle at intervals of 0.25 seconds) to receive a response from the electrical key transmitter sub-assembly. When the electrical key transmitter sub-assembly is brought into an exterior detection area, it receives LF waves from the vehicle. Using RF waves, the electrical key transmitter sub-assembly responds to the vehicle. Upon receiving the response from the electrical key transmitter sub-assembly, the certification ECU (smart key ECU assembly) activates the electrical key antennas (outside) one by one. 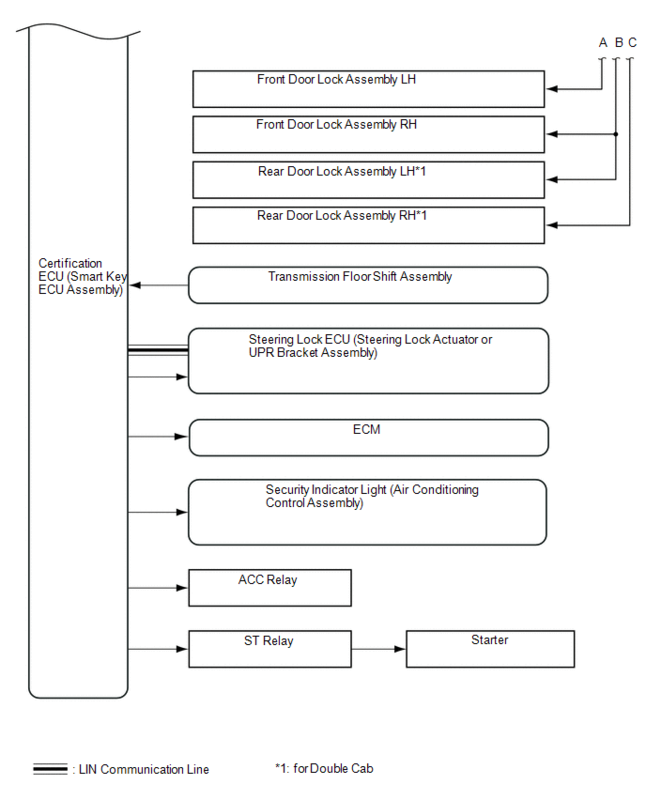 Using LF waves, the certification ECU (smart key ECU assembly) determines which exterior detection area the electrical key transmitter sub-assembly is in. The electrical key transmitter sub-assembly sends the key ID information using RF waves. When the certification ECU (smart key ECU assembly) receives it, verification completes. The multi channel system changes the channels when the RF band (*b, *d and *f) is interrupted by wave interference. Refer to the table below to confirm when the system changes the channels. RF waves cannot be received. RF waves cannot be received properly. The channels will not be switched. The channels will be switched. The channels will be switched*. *: The channels are not switched during vehicle interior verification after an entry lock operation is performed. When the channels are switched, the history will be stored in the certification ECU (smart key ECU assembly). This history can be read using the Techstream. (See page ). (a) Some customers may inquire about the frequency used by the smart key system (for Entry Function) on various models. This repair manual contains the applicable specifications of the smart key system (for Entry Function). Turn the engine switch off and lock all the doors, then take the electrical key transmitter sub-assembly approximately 3 m (9.84 ft.) or more away from the vehicle. The detection area of each electrical key antenna (outside) is formed by emitting a periodic LF band request signal every 0.25 seconds. The detection area formed by each front door outside handle assembly (electrical key antenna) has a detection range of approximately 0.7 m (2.30 ft.). Bring the electrical key transmitter sub-assembly within 0.7 m (2.30 ft.) of the driver door. The system is in unlock standby mode when the electrical key transmitter sub-assembly is in the detection area and the key ID code sent by the electrical key transmitter sub-assembly matches the key ID code stored by the certification ECU (smart key ECU assembly). The door unlocks if the unlock sensor is touched by hand with the system in unlock standby mode. The electrical key transmitter sub-assembly LED starts blinking. If it does not, any of the parts listed in the table below may be malfunctioning. The key ID code sent by the electrical key transmitter sub-assembly does not match the key ID code stored in the certification ECU (smart key ECU assembly). Use another electrical key transmitter sub-assembly to check the operation. If the LED of the electrical key transmitter sub-assembly does not blink when it is brought within 0.7 m (2.30 ft.) of the driver door, perform the following procedure. Press the lock and unlock buttons of the electrical key transmitter sub-assembly to check the operation. If the doors can be locked and unlocked, that means the detection area has not been formed. Parts other than the electrical key transmitter sub-assemblies and electrical key and TPMS receiver assembly may be malfunctioning. If the electrical key transmitter sub-assembly malfunctions, the engine cannot be started and the engine switch cannot be turned on (ACC or IG). Under normal operation, the "Power ON" is displayed on the multi-information display in the combination meter assembly when the engine switch is pressed with the electrical key transmitter sub-assembly in the driver seat, the shift lever in P and the brake pedal not depressed. If the door cannot be opened, use the mechanical key installed in the electrical key transmitter sub-assembly to open the door. Before replacing the electrical key transmitter sub-assembly, check if the transmitter battery is depleted. Press and hold the lock switch of the electrical key transmitter sub-assembly for 5 seconds and check the number of times that the transmitter LED blinks. If the transmitter LED does not blink or blinks only once or twice, the transmitter battery may be depleted. If the transmitter LED does not blink at all, the electrical key transmitter sub-assembly may be malfunctioning. If the transmitter battery voltage at the time the electrical key transmitter sub-assembly sends a signal drops to 2.2 V or less, "Yes" is displayed for "Key Low Battery" in the Data List. If the transmitter battery voltage drops to 2.0 V or lower, operation cannot be assured. The output of the electrical key transmitter sub-assembly will decrease if it is in low temperatures. When the transmitter battery is depleted, the engine cannot be started and the engine switch cannot be turned on (ACC or IG). If the electrical key transmitter sub-assembly is held near the engine switch the engine can be started. Make sure that the transmitter battery type and installation direction are correct. If the problem occurs in certain locations or times of day, the possibility of wave interference is high. When the electrical key transmitter sub-assembly is malfunctioning, the transmitter battery is depleted, an electrical key transmitter sub-assembly from another vehicle has been used or wave interference is suspected. "Yes" may be displayed for any of the following Data List items: "Unmatch Code or Form", "No Response", "ID Code Difference" or "Unmatched Vehicle-ID"
Vehicle exterior detection area is not formed properly. Even if the vehicle exterior detection area is not formed properly, the engine switch can be turned on (ACC) and the engine can be started. Formation of the vehicle exterior detection area can be confirmed by using the Techstream. (See page ). Even if the vehicle exterior detection area is not formed properly, the doors can be unlocked by pressing the unlock button of the electrical key transmitter sub-assembly. If the electrical key and TPMS receiver assembly is malfunctioning, it is not possible to unlock the doors by a wireless unlock operation. If the electrical key and TPMS receiver assembly is malfunctioning, the engine cannot be started and the engine switch cannot be turned on (ACC or IG) unless in an emergency. It may be possible to tell whether the vehicle battery is discharged by operating the horn. 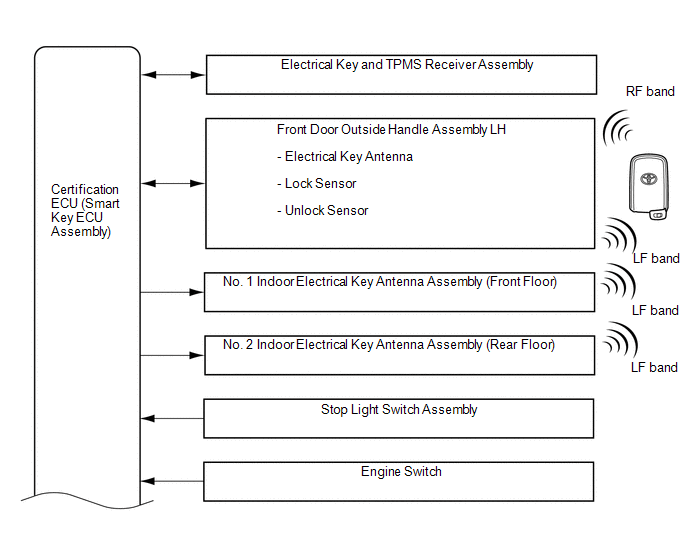 If the smart key system function has been canceled through the customize function, the detection area cannot be formed, therefore the electrical key transmitter sub-assembly LED will not blink even if the electrical key transmitter sub-assembly is brought near a front door outside handle assembly. If the electrical key transmitter sub-assembly is in battery saving mode, even if it receives LF waves from the vehicle, it does not respond using RF waves, therefore the electrical key transmitter sub-assembly LED does not blink. In the smart key system, if the electrical key transmitter sub-assembly is constantly in the exterior detection area of one of the doors, the transmitter battery could be drained. For this reason, if this state continues longer than 10 minutes, the smart key system automatically deactivates the exterior detection area that the electrical key transmitter sub-assembly is in. If the electrical key transmitter sub-assembly is left in the vehicle and the doors are locked using another electrical key transmitter sub-assembly, the electrical key transmitter sub-assembly LED will not blink even if it is brought near a front door outside handle assembly. Touch the unlock sensor of the driver door with the electrical key transmitter sub-assembly in the exterior detection area. While the doors are unlocked, the answer back is performed at the same time. If they do not, any of the parts listed in the table below may be malfunctioning. Tester connection "main body ECU (multiplex network body ECU), driver side junction block (ACT-)*"
The suspected parts below overlap with the parts covered in operation 2 for when the electrical key transmitter sub-assembly LED does not blink. Under normal operation, "ON" is displayed for the Data List item "D-Door Touch Sensor" when the unlock sensor is touched. If a door cannot be locked/unlocked by operating the door control switch on the door in the cabin, the door lock mechanism is malfunctioning. After getting into the vehicle while carrying the electrical key transmitter sub-assembly, close the door and press the engine switch once with the shift lever in P while not depressing the brake pedal. The blinking security indicator light goes off, and then the set immobiliser function cancels, allowing the vehicle to be driven. The steering wheel is unlocked. If it does not, the parts listed below may be malfunctioning. When the engine switch is pressed, the indoor electrical key antenna forms a key detection area inside the vehicle and detects the electrical key transmitter sub-assembly in the cabin. The electrical key transmitter sub-assembly sends the ID code upon receiving a request signal and the electrical key transmitter sub-assembly LED illuminates for a short time. After pressing the engine switch, if the key ID code sent by the electrical key transmitter sub-assembly matches the key ID code stored by the certification ECU (smart key ECU assembly), the ACC relay turns on and the "ACCESSORY" is displayed on multi-information display in combination meter assembly. Then after the power source mode has changed and L code verification has been completed, the steering wheel will be unlocked and the immobiliser will be inactive. Then the Data List status of "Immobiliser" will be changed from "Set" to "Unset". Within approximately 30 seconds after any of the doors have been closed and opened. Within approximately 30 seconds after any of the doors have been opened and closed. Within approximately 30 seconds after the brake pedal has been depressed. Right after the engine switch is pressed. If malfunctions occur at a specific location/time, wave interference may be the cause. If wave interference is suspected in the cabin, disconnect all the connectors of electronic devices besides standard equipment, or remove the electronic devices and check for noise. Indoor electrical key antenna assemblies that form the interior detection areas. If the interior detection areas are not formed properly, the engine cannot be started and the engine switch cannot be turned on (ACC or IG). If the electrical key transmitter sub-assembly is held near the engine switch in an emergency, the engine can be started. Using the Techstream, enter the key diagnostic mode to forcibly form the interior detection area. If the electrical key transmitter sub-assembly is brought near the area, short beeps sound (See page ). Under normal operation, after the engine switch is pressed, "ON" is displayed for the Data List items "Start Switch1" and "Start Switch2". If "OK" is displayed for the Data List item "L Code Check" when the engine switch is turned on (ACC), power will be supplied to the steering motor for approximately 10 seconds. Then the ECU sends an unlock signal to the steering motor and the Data List item "Unlock Request Receive" temporarily changes from "NG" to "OK". After the steering unlocks the ECU receives the unlocked signal from the steering motor and the Data List item "Steering Unlock" changes from "Unset" to "Set". In order to unlock the steering wheel, it is necessary that "OK" is displayed for the Data List item "L Code Check" (the ID code stored in the steering lock ECU (steering lock actuator or UPR bracket assembly) matches that of the certification ECU (smart key ECU assembly)). The electrical key transmitter sub-assembly, the transmitter battery and the vehicle battery have already been inspected in the previous operation steps. However, if they have not been inspected, inspect them. Depress the brake pedal with the shift lever in P while carrying an electrical key transmitter sub-assembly. The smart warning light appear on the multi-information display. If it does not, the parts listed below may be malfunctioning. If the brake pedal is depressed, "ON" is displayed for the Data List item "Stop Light Switch1". Start function-Terminals of ECU (See page ). After getting into the vehicle while carrying the electrical key transmitter sub-assembly, press the engine switch with the shift lever in P while depressing the brake pedal. The engine starts. If it does not, the parts listed below may be malfunctioning. If the engine switch is pressed with the steering wheel unlocked, 12 V will be supplied from terminal STAR of the certification ECU (smart key ECU assembly) to the ST relay. Under normal operation, the steering wheel will be unlocked and "ON" is displayed for the Data List item "Steering Unlock Switch". The Data List item "Starter SW" is an instruction to operate the starter. If this turns "ON", 12 V will be supplied from terminal STAR of the certification ECU (smart key ECU assembly) to the ST relay. The Data List item "Starter Relay" indicates the voltage at the STA terminal of the certification ECU (smart key ECU assembly). This indicates whether voltage is being supplied to the ST relay. Whether the vehicle battery is discharged or not can be checked easily by operating the horn. The engine stops, the smart warning light illuminates green and then goes off and the security indicator light changes from off to blinking. Open any of the doors with the engine switch off. The steering wheel locks. If it does not, the parts listed below may be malfunctioning. When any of the doors are opened, "OFF" is displayed for the Data List item "FL Door Courtesy". Touch the lock sensor of the driver door outside handle while carrying the electrical key transmitter sub-assembly. Answer back is performed at the same time when the doors are locked. (a) When the smart key system is operating, the vehicle performs key detection operations every 0.25 seconds. Therefore, if the vehicle is left as is for a long period of time, the vehicle battery may become fully discharged. The following controls help reduce the rate at which the vehicle battery is discharged. (1) If the smart key system is not operated for 5 days or more, periodic signal transmission from the electrical key antennas stops. 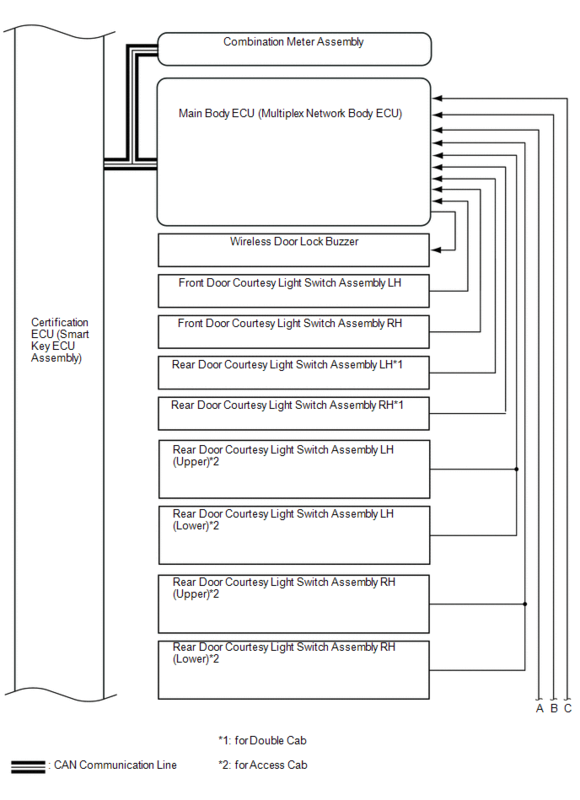 However, the doors can still be unlocked by touching the unlock sensor of a front door outside handle assembly LH. (2) If the smart key system is not operated for 14 days or more, the lock and unlock sensors of the front passenger door outside handle assembly are disabled. Therefore, only the unlock sensor of the front door outside handle assembly LH can be used to unlock the doors. (3) If 10 minutes or more elapse while the electrical key transmitter sub-assembly is in an exterior detection area, the front door outside handle assembly LH (electrical key antenna) detecting the electrical key transmitter sub-assembly will stop operating. (b) To restore operation of the smart key system, perform any of the following operations. (1) While carrying the electrical key transmitter sub-assembly, touch the lock or unlock sensor of the front door outside handle assembly LH and perform a door lock or unlock operation. (2) Lock or unlock the doors with the wireless operation. (3) Insert the mechanical key into the door key cylinder of the driver door and lock or unlock the doors. (a) The volume of the wireless door lock buzzer can be changed through the customize function. The volume of the following wireless door lock buzzer operations cannot be adjusted. (1) Situation: The engine is left running and the shift lever is in a position other than P when the driver gets out of the vehicle. There are 2 patterns for this situation. When the engine is left running and the shift lever is in a position other than P, the driver opens the door and attempts to get out of the vehicle. The engine switch is on (ACC) or on (IG). The shift lever is in a position other than P.
The driver door is opened. The vehicle speed is 0 mph (0 km/h). Buzzer in combination meter assembly sounds continuously. "Shift to P Position" is displayed on multi-information display in combination meter assembly. The engine switch is turned off. The shift lever is in P.
The vehicle speed is 5 km/h (3.11 mph) or more. Under the situation of pattern 1, the driver closes the door and attempts to leave the vehicle while holding the electrical key transmitter sub-assembly. The driver door is opened → closed. The electrical key transmitter sub-assembly is not in the vehicle. The engine switch is turned off ([A] continues to be displayed). Electrical key transmitter sub-assembly is returned to the vehicle ([A] continues to be displayed). The vehicle speed is 5 km/h (3.11 mph) or more. ([B] continues to be displayed). The shift lever is in P ([B] continues to be displayed). (2) Situation: The key reminder sounds. When the driver door is open, the driver turns the engine switch on (ACC) and attempts to leave the vehicle. The engine switch is on (ACC). The engine switch is off. Buzzer in combination meter assembly sounds continuously at short and even intervals. The engine switch is turned on (IG). The engine switch is turned off and the steering wheel is locked. (3) Situation: The engine is left running with the shift lever in P when the driver gets out of the vehicle. When the engine is left running with the shift lever in P, the driver closes the driver door and attempts to leave the vehicle while carrying the electrical key transmitter sub-assembly. Buzzer in combination meter assembly sounds once. Wireless buzzer sounds 3 times. "Key Not Detected" is displayed on multi-information display in combination meter assembly. The electrical key transmitter sub-assembly is returned to the vehicle. Under the situation of pattern 1, the driver touches the lock sensor on the door outside handle assembly. The electrical key transmitter sub-assembly is not in the inside detection areas. The electrical key transmitter sub-assembly is in the outside detection areas. The lock sensor is on. 5 seconds have elapsed after the wireless door lock buzzer is activated (only wireless buzzer stops). Any door is opened or closed (only wireless buzzer stops). (4) Situation: The engine is left running when a passenger gets out of the vehicle while carrying the electrical key transmitter sub-assembly. When the engine is left running, a passenger leaves the vehicle while carrying the electrical key transmitter sub-assembly. A door other than the driver door is opened → closed. (5) Situation: The electrical key transmitter sub-assembly is not in the detection areas. When the electrical key transmitter sub-assembly is not in the vehicle or the transmitter battery is depleted, the driver attempts to start the engine or turn the engine switch on (IG). A door is not unlocked using the mechanical key and the engine switch is pressed. The electrical key transmitter sub-assembly is not in the vehicle or the transmitter battery is depleted. The engine immobiliser system is set. "Key Not Detected" is displayed on multi-information display in combination meter assembly for 15 seconds. (6) Situation: The vehicle is driven without an electrical key transmitter sub-assembly. When the vehicle starts moving without the registered electrical key transmitter sub-assembly in the vehicle. The engine switch is on (IG). Warning of due to electrical key transmitter sub-assembly being brought out of vehicle is output. Buzzer in combination meter assembly sounds nine times. (7) Situation: The electrical key transmitter sub-assembly is left in the vehicle. The lock sensor on a front door outside handle assembly LH is touched to perform entry lock with the electrical key transmitter sub-assembly left in the vehicle. The electrical key transmitter sub-assembly is in the vehicle. The lock sensor on a front door outside handle assembly LH is on (touched). The vehicle speed is 0 km/h (0 mph). Wireless buzzer sounds continuously for 5 seconds. "Key Detected in Vehicle" is displayed on multi-information display in combination meter assembly for 60 seconds. The engine switch is turned to a mode other than off. Any door is opened (only wireless buzzer stops). (8) Situation: Door is ajar. The lock sensor on the door outside handle assembly is touched to perform entry lock with a door open. Any door other than the door that performed the entry lock operation is open. The lock sensor on or lock switch is pressed on electrical key transmitter sub-assembly. An unlock operation is performed using the wireless door lock remote function. The touch sensor on the inner side of a door outside handle assembly is used to perform entry unlock. (9) Situation: The electrical key transmitter sub-assembly is locked inside the vehicle. With a door open and the electrical key transmitter sub-assembly in the vehicle, the lock knob is locked and then the door is closed with the door handle being pulled. With a door open, the lock knob is locked and then the door is closed with the door handle being pulled. (10) Situation: The transmitter battery is weak. The vehicle is driven using an electrical key transmitter sub-assembly that has a low transmitter battery. The engine switch is turned off after being left on (IG) for more than 20 minutes. The transmitter battery voltage is low. The engine is off → the engine is started. "Key Battery Low" is displayed on multi-information display in combination meter assembly for 15 seconds. The transmitter battery is replaced with a new one. (11) Situation: The steering wheel cannot be released. The steering wheel cannot be released, thus the engine is prevented from starting. The shift lever is moved to a position other than P before the steering wheel is unlocked. Steering wheel cannot be unlocked. "Steering Lock ON" is displayed on multi-information display in combination meter assembly for 15 seconds. (12) Situation: The smart key system is malfunctioning. An IG circuit malfunction, vehicle speed signal malfunction or malfunction that interferes with steering lock ECU (steering lock actuator or UPR bracket assembly) operation, has been detected. The steering lock ECU (steering lock actuator or UPR bracket assembly), driver of the certification ECU (smart key ECU assembly) or unlock detection switch is malfunctioning. 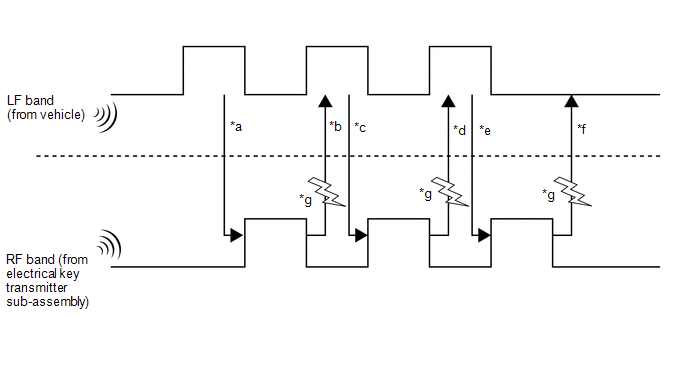 An IG relay output circuit malfunction occurs three times or more consecutively. The vehicle speed is judged as abnormal or vehicle speed signal communication is malfunctioning. "Smart Entry & Start System Check" is displayed on multi-information display in combination meter assembly for 15 seconds. The system returns to normal. When the engine switch is pressed, the electrical key transmitter sub-assembly cannot be detected in the vehicle two times in a row. Key code verification error occurs when the engine switch is pressed twice or the driver door key linked unlock operation is performed. "Key Battery Low Engine Start: Press Brake Pedal, Push Engine Switch with Key" is displayed on multi-information display in combination meter assembly for 60 seconds. There are two patterns for this situation. The engine might be started (when the driver gets in the vehicle, or the engine switch is turned on (ACC)). After the doors are unlocked from outside the vehicle with the engine switch off, the driver door is opened. With the brake pedal not depressed, the engine switch is turned on (ACC). "Engine Start: Press Brake Pedal and Push Engine Switch" is displayed on the multi-information display in the combination meter assembly. 20 seconds have elapsed after the warning started. The engine speed is at 200 rpm or more. The doors are locked from outside the vehicle. The doors are locked by a wireless door lock operation from inside the vehicle. The engine might be started (when the engine switch is on (IG)). With the shift lever in P or N and the brake pedal not depressed, the engine switch is turned on (IG) (the engine is not started). The engine switch is on (IG) (the engine is not started) and the shift lever is moved from a position other than P or N to P or N.
The power source mode is changed to any mode other than on (IG). The vehicle speed is 5 km/h (3 mph) or more. The shift lever is moved to a position other than P or N.
(15) Situation: The engine switch cannot be turned off. A warning message appears on the multi-information display when the driver attempts to turn the engine switch off with the shift lever in any position other than P or N.
The engine switch is turned off with both conditions below met. Shift lever in any position other than P or N.
Even though the engine switch is pressed, the power source mode does not change to off (excluding emergency stop operation). The engine switch is turned to a mode other than ACC. The shift lever is moved to P.
Under the situation of pattern 1, the shift lever is moved to P.
"Turn Power OFF" is displayed on multi-information display in combination meter assembly. The power source mode is changed to mode other than on (ACC). The shift lever in any position other than P.
(16) Situation: Auto power off operation occurs. A warning message appears on the multi-information display when automatic power off operation occurs. The power source control system is turned off by automatic power off function. "Powering OFF to Conserve Battery" is displayed on multi-information display in combination meter assembly for 10 seconds. (17) Situation: Engine immobiliser system certification completion occurs. When an electrical key transmitter sub-assembly with a depleted transmitter battery is held near to the engine switch while depressing the brake. Electrical key transmitter sub-assembly certification result is OK.
"Engine Start: Press Brake Pedal and Push Engine Switch" is displayed on multi-information display in combination meter assembly for 10 seconds. The electrical key transmitter sub-assembly is detected to the vehicle. The engine is running at 500 rpm or more. The engine immobiliser system is set and room recognize is stopped or cannot be recognized.